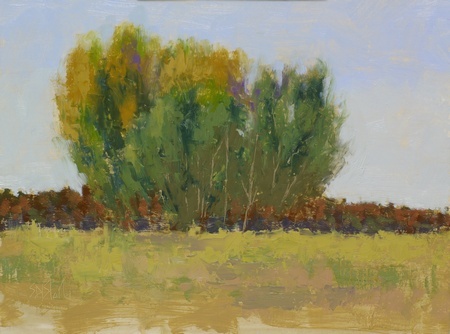 Cottonwoods. 11x14, oil on linen panel. 2015. Today's paint out was at Great Country Farms in Bluemont, VA. This will probably end up being my last plein air of the year. This is one of the few locations (perhaps the only one?) in Loudoun County that has stands of cottonwood trees, so I made the most of this opportunity and worked on a larger panel than I usually do. To help enhance the look of the trees against the sky, I reduced the size of the mountains in the background. I also replaced some water in the foreground with grass and removed a barn structure. Sometimes nature needs a little help.